View newsletter in your browser. NewWave and its vendor partners want to reward you for your business! As your value added distributor NewWave works hard to offer you these promotional opportunities. Take advantage and learn how you can qualify for prizes by clicking on each vendor logo. Robust desktop information capture, delivered to your business processes. 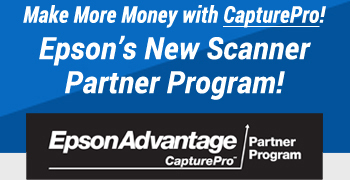 As an Epson CapturePro Partner you will have access to benefits, rewards and resources that are designed to increase profitability and create new opportunities! Contact your NewWave Sales Rep to learn how to join the program today! Click here to view our entire Webinar Archive. What is Alaris Info Input? Kodak Alaris' web-based and mobile capture solution was designed to simplify document capture and to ensure that information can be intelligently used in any business processes. Formatta enables businesses to simplify the task of obtaining signatures on any form and expedite the signing process in a seamless and efficient way. Click here to learn more about Formatta's eSignature & Form Automation Solution. Reduce cost and mitigate risk with sophisticated content analysis and data migration in a highly automated and scalable solution. Working in partnership with you, NewWave's pre-sales support team can help you identify your customers' capture requirements, configure the right solution to fit your customer's needs and assist you in positioning and closing your capture opportunities. Click a logo below to access each vendor program page. NewWave Technologies, Inc. | 4635 Wedgewood Blvd. Suite 107, Frederick, MD 21703 | www.newwavetech.com | (800) 536-5222. NewWave Technologies and the NewWave logo are trademarks of NewWave Technologies, Inc. All other trademarks are the property of their respective owners. © copyright 2017 NewWave Technologies, Inc. All rights reserved.